With Match! 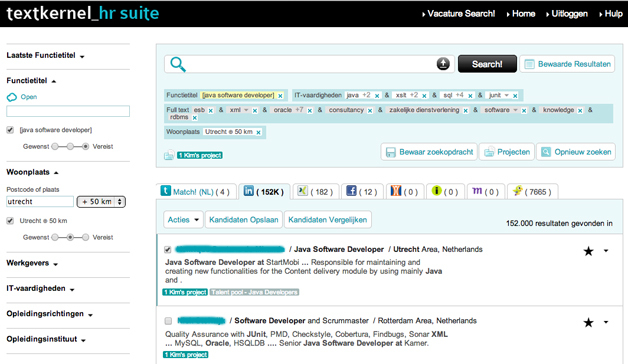 you can automatically search with your job vacancy text for suitable candidates in your CV databases, but also in job boards and social media. Using your job vacancy text, Match! automatically creates a search and performs this on your CV databases and at the same time also on external job boards and social media. Job matching can be done with your own jobs or online jobs found by Jobfeed. Jobfeed is Textkernel’s Big Data tool for jobs that collects and structures all online job vacancies in (currently available in Austria, Belgium, Germany, France, the Netherlands, UK and US) and makes them searchable. Matching jobs to resumes in multiple databases, offers you a good starting position for active sourcing of candidates. With the tagging functionality, which allows you to label candidates, you can create talent pools more easily. With Textkernel’s semantic search and matching technologie it becomes even easier to create talent pools. When you found several suitable profiles after matching with your job ad, you can build a talent pool by bookmarking the results. When you need a similar profile later on, you can directly consult your talent pool. You can tag your own candidates, but also candidates found on external sites.